ANY AMOUNT HELPS! We are proud to assure you that your donation goes directly to providing life-saving services for homeless dogs. 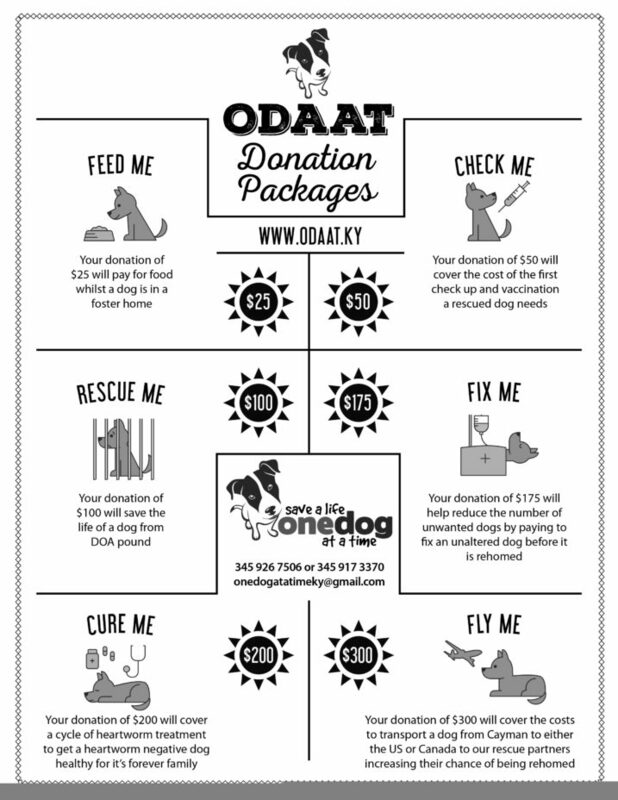 All ODAAT funds comes solely from donations from members of our compassionate, animal-loving community. All donations go directly to the dogs to pay for veterinary care, flights and food. Please consider making a one-time donation or become a monthly sponsor. Donations can be made directly into our account at Cayman Animal Hospital on Crewe Road either in person or over the phone using a credit card. Please do message us so we know that you have done this so we can update our accounts. Alternatively US or CI checks can be made payable to Cayman Animal Hospital and mailed to One Dog at a Time, PO Box 30568, Grand Cayman, KY1-1203, Cayman Islands. Please see below what a donation covers. HOW FAR DOES A DONATION GO?